Veteran Tuition Assistance – Veterans have put their lives on the line to protect our country. After coming home, some have trouble finding an adequate career. That is why Veteran Adjusting School has created a vocational training program geared toward training vets in CAT or catastrophic insurance adjusting. With over 95% job placement and VA tuition assistance under the 9/11 GI Bill ® , VAS has a track record of putting veterans to work in the CAT adjusting career field. Catastrophic insurance adjusters are deployed to a region that has been affected by a catastrophic event (hurricane, flood, wildfire, hailstorm, etc.). These CAT adjusters are independently contracted by insurance agencies and independent firms to perform inspections for the insurance company policy holders. They assess the damage in order to get these customers the compensation they are entitled to under their policy. Vacation time – CAT adjusters generally only work during the storm season which typically lasts from 6 to 9 months a year. This leaves plenty of vacation time to enjoy the fruits of their labors. Helping people – After a catastrophic event, the people who have been affected are in need of compensation to rebuild. Catastrophe adjusters are able to help them get that compensation. There are certain characteristics an adjuster must possess in order to have success in the CAT adjusting field. They must be hard-working, organized, self-motivated, and dedicated. These traits are quite common among veterans as they have gone through the training and rigors of the military experience. A rewarding career in CAT adjusting is not for everyone. Do you have what it takes? Are you a veteran of the armed forces looking for a school with veteran tuition assistance from the VA? Looking for the right school with job placement? Then you might want to consider VAS or Veteran Adjusting School for your vocational training. VAS is a CAT or catastrophic insurance adjuster training school that is VA approved for tuition assistance by the VA under the 9/11 GI Bill ®. VAS has over 95% job placement for its graduates directly out of school with their independent firms and insurance agency partners. When a geographical area is hit by a catastrophic event, insurance agencies and independent firms contract and deploy CAT adjusters to the affected region. They will spend weeks to months at a time in the area performing inspections to assess how much compensation the insurance customers are entitled to under their policy. There is a very high earning potential as CAT adjusters are paid per claim closed. That is why it is often said among catastrophic adjusters, “Make 6 figures in 6 months.” They typically only work 6 to 9 months during storm season which leaves plenty of vacation time to enjoy their hard earned income. Veterans have character attributes and experience that have come from military training and service that are indispensable in the catastrophic adjusting field. In order to succeed a CAT adjuster must be hardworking, organized, self-motivated, and dedicated. Although they are contracted and therefore self-employed, catastrophic insurance adjusters can work long days and long weeks in adverse conditions away from home. This is another reason why veterans of the armed forces are ideal candidates for this career. Veteran Adjusting School has built their agency and firm partnerships through producing a comprehensive course curriculum that utilizes a mixture of traditional and alternative teaching practices. The course takes the student from newcomer to pro in six weeks. The real-world storm simulation portion provides an interactive model for the students to test their knowledge and gain insights from school mentors. VAS has also been so successful because they aren’t looking for students, they are looking for dedication. CAT adjusting can be a rewarding career for the right person. Do you have what it takes? Since the inception of the 9/11 GI Bill ®, The Dept. 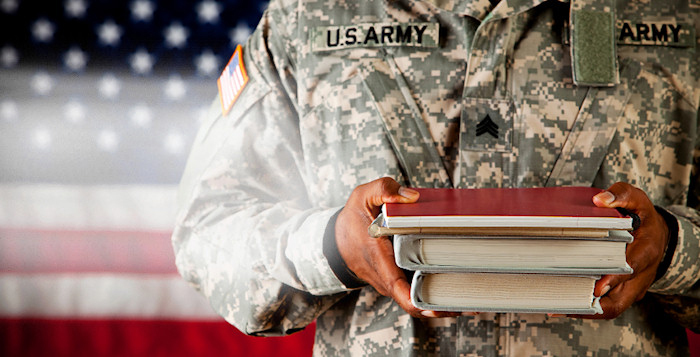 of Veteran Affairs provides tuition assistance benefits to approved schools for military veterans of the armed forces. These schools give the veteran student the knowledge they need to succeed in a career. If you are a veteran seeking career options, using the VA tuition benefits can help you receive an education for a high paying job. One of the VA-approved schools, Veteran Adjusting School, prepares students for a 6-figure career in catastrophic insurance claims adjusting. Independent CAT adjusters’ average income ranges between $70,000 – $100,000 in 6 – 9 months. Veteran Adjusting School has 100% graduation rate and over 96% job placement. When a catastrophic event (hurricane, hail storm, flood, etc.) occurs, insurance agencies send catastrophe adjusters out to estimate how much compensation the insured customer is entitled to under their insurance policy. The CAT adjuster will then send their assessments to the insurance agency and are typically paid per claim closed. This is why there is such a high earning potential for a hard-working adjuster during the storm season. Veterans have an outstanding work ethic (developed in the military) that helps them excel in the catastrophe adjusting field. CAT adjusters are deployed to an affected storm region for weeks to months at a time. Successful CAT adjusters will be hard-working, organized, self-motivated, and dedicated. These are all traits that are common among veterans. Veteran Adjusting School has such a high graduation and job placement rate because VAS is looking for commitment, not just students. Catastrophe adjusting is a rewarding career, but it’s not a career for everyone. Do you have what it takes to be a successful catastrophic insurance claims adjuster?